Ondine's recording (...) has just about ideal depth and perspective. 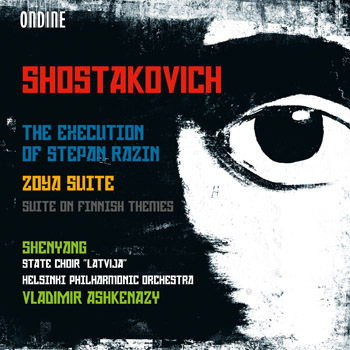 With this release Ondine presents two dramatic works by Dmitri Shostakovich, The Execution of Stepan Razin and the Zoya Suite, coupled with his Suite on Finnish Themes. The Execution of Stepan Razin, premiered in Moscow in 1964, got a mixed reception. The execution scene and the final, tragic vision is simply spine-chilling: Stepan Razin's bloody head rolls to the ground and bursts out laughing at the Tsar. Capturing rich intonations and melodies of the text, the bass soloist and the chorus engage in a multi-layered dialogue of this very theatrical work. The Zoya Suite is an orchestral suite from the music for the film Zoya (1944) a product of the war years, that tells of the cruel fate of 18-year-old partisan Zoya Kosmodemyanskaya fighting against the Germans. Shostakovich can well and truly be regarded as the father of Russian film music and also here, it's not only musical illustration, but he endowed the film with the drama of a classical symphony. First performed in 2001, the Suite on Finnish Themes is a rather unknown work as being only discovered nearly four decades after Shostakovich died. The suite includes several arrangements of Finnish folk songs featuring a soprano and a tenor soloist. 28-year-old bass-baritone Shenyang was the winner of the 2007 BBC Cardiff Singer of the World competition, a 2008 winner of the Borletti-Buitoni Trust Award, and a 2010 winner of the Montblanc New Voices at Stars of the White Nights Festival. Shenyang embodies a 21st century bridge between the cultures of East and West. Born in Tianjin, China, he studied at the Shanghai Conservatory and is an alumnus of the Metropolitan Opera Lindemann Young Artist Development Program and of the Julliard School Opera Center. Recent highlights have included a return to the New York Metropolitan for a new production of Don Giovanni, and debuts at the Glyndebourne Festival and the Bavarian State Opera. Other performances have taken him all over North America and Europe. The Helsinki Philharmonic Orchestra continuously collaborates with Ondine, having released a remarkable discography that has been awarded with many prizes. Celebrating its 70th anniversary in 2012, the State Choir "Latvija" is one of Europe's finest choirs and the winner of many awards. Its repertoire covers golden classics in all genres of choral music, both accompanied and unaccompanied, in a time frame from the early Renaissance to the present day. In recent years it has partnered leading orchestras in many parts of the world under numerous outstanding conductors. Vladimir Ashkenazy has built an extraordinary career, not only as one of the most renowned and revered pianists of our times, but as an artist whose creative life encompasses a vast range of activities and continues to offer inspiration to music-lovers across the world. Vladimir Ashkenazy is featured on several Ondine releases. Recordings with the Helsinki Philharmonic Orchestra include Berlioz's Harold in Italy (ODE 1188-2), Josef Suk's Asrael Symphony (ODE 1132-5) and Rautavaara's Third Piano Concerto Gift of Dreams (ODE 950-2), commissioned by Ashkenazy as a concerto which he could conduct from the piano.